This is a column that I wrote for The Barrow Journal, and it’s the second part of a two-part series on project-based learning. In it I describe the hammerhead shark project that I did with my 4-year-old son. You can read the first part here. Above is a photo of the poster board we made during this fun project. Last week I wrote what I learned about project-based learning from Lori Pickert’s blog at www.whiteoakschool.com. This week I’m going to tell you about my son’s first project. When I asked him what he might want to learn about, he told me, “hammerhead sharks.” He loves ocean animals, so this wasn’t a surprise to me. In project-based learning, the emphasis is to teach children how to acquire information. It also emphasizes letting them have as much control over the project as possible. Asking children questions instead of supplying them with quick answers engages them in problem solving. At age four, however, my son doesn’t have a lot of ideas on how to proceed with projects. He either says an emphatic yes or no to my suggestions. At this point project-based learning is more for me to learn and think about ways in which I can get him to take the lead and learn where to go for information. A while back, he received for a gift a stack of cards about oceans animals, bound together with a large ring. On the back of each card, there are two or three basic facts about the animal. I had forgotten about these cards, but he didn’t, and it was a good starting point. For example, we learned there are nine species of hammerhead sharks. Though he might not always have an answer for me when I ask him where we should go for information, I could certainly see the benefit in giving him the chance. 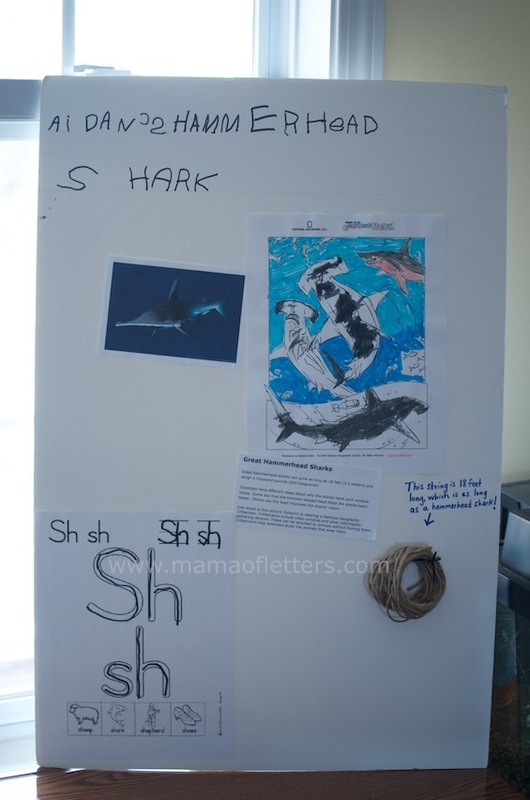 Later in the day while his little brother was napping, we made a poster about hammerhead sharks. I was surprised at how interested and attentive he was. He was willing to copy the words “hammerhead shark” on the top, and we colored a picture we found on the Internet. We also reviewed the sound “SH” as in “shark.” It was much more fun than the preschool workbooks that we often do together during this time. The most fun we had was when we got a long string and measured it to 18 feet, which is as long as a hammerhead shark can grow. Then we rolled up the string and taped it to the poster board. After that, my son wanted to measure how long a humpback whale would be, so we looked it up and found out that they grow between 39-53 feet. It was a good lesson in numbers and measurement, and we were both delighted and surprised to find out that a humpback could grow longer than our house! The next day we went to the library, and my son said he wanted books about hammerhead sharks and humpback whales. Usually I ask the librarian, or I look up the books on the computer, but this time I thought I would encourage my son to ask the librarian himself. Sometimes he’s shy, so I wasn’t sure if he would. Again, my son surprised me by speaking up when we were in front of the librarian, and he was very happy with the books she found for him. By the next day, my son seemed satisfied with our work on hammerhead sharks and didn’t want to pursue it anymore. This was fine with me, although I admit I would have happily delved further into the subject. When I contacted Lori by e-mail, she told me that I don’t have to worry too much about projects at this age. Right now it’s important to create an environment where materials are accessible to him, and it’s helpful if I begin to keep notes about the questions he asks and the things he does. I don’t know if we will always used a project-based approach to homeschooling, but I have learned some valuable tools that will help me help him. Have you used project-based learning? Please tell me about it. I’m so glad I found this on your blog! I’ve been using project-based homeschooling for a little while now. It started about two years ago while at a friends birthday picnic in Central Park. My boys, then 5 and 4 took to a few older couples there that day (not part of our picnic party) because they were bird watching. The couples allowed them to look through their binoculars, check out a few birds there at Turtle Pond… and it turned into our first child-led project. We went to the library at home and we found bird books, both for children and field manuals. They were able to look up different birds, got their own binoculars as gifts, started looking out their own windows for birds, and even got these terracotta bird callers. Even now, two years later, my children still love to bird watch!